Old-fashioned Sunday dinner. It brings to mind thoughts of family gathered around the table and enjoying a delicious, home-cooked meal together. Sound like a nostalgia memory that doesn’t fit into the busy lifestyles of today’s families? It is easier than you think. 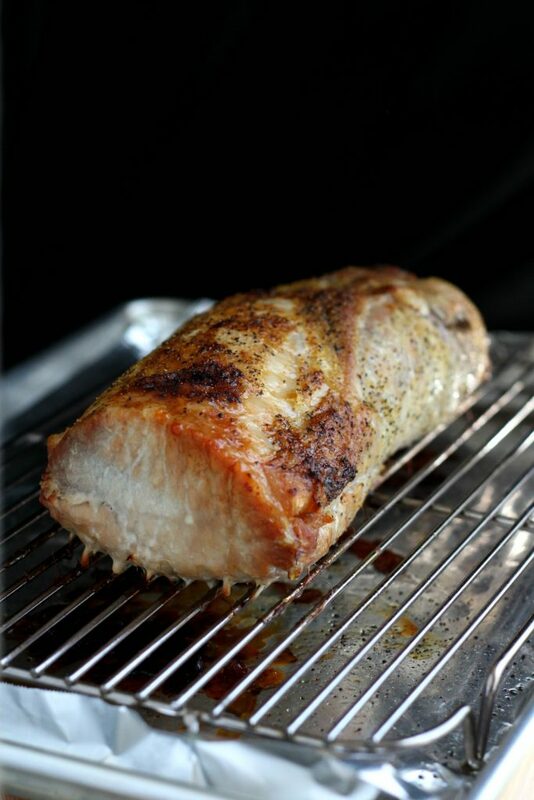 Pork Roast Sunday Dinner cooks in the oven while you prepare the sides. 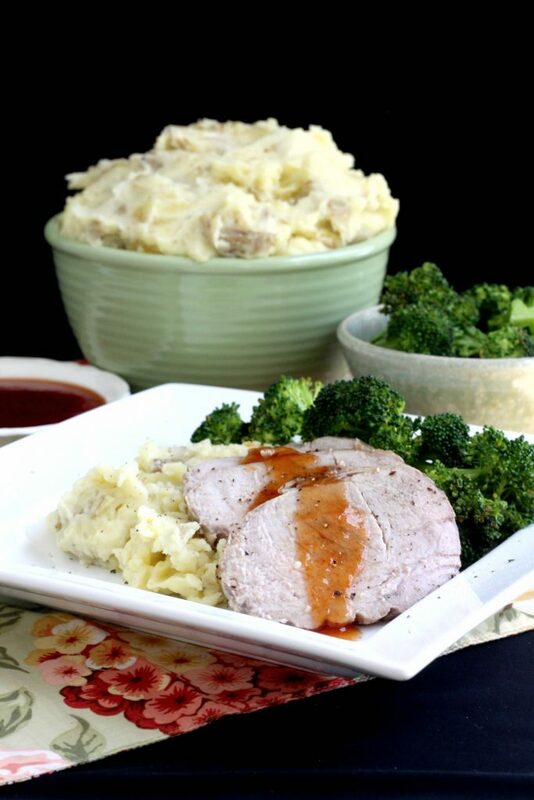 Mashed potatoes and steamed broccoli are comforting sides to serve with pork. Make sweet and sour sauce to spooned over the pork. It adds so much flavor! I have listed the meal preparation in the order I follow making best use of time. The whole meal can be made from start to serving in less than two hours. Roasting time depends on the size of the pork roast you are making. Mine weighed 3.65 pounds and took a total time of 1 hour and 10 minutes to reach an internal temperature of 145 degrees. After resting, tented with foil, the temperature rose to 160 degrees. Begin by lightly brushing the roast with olive oil. Place on a roasting rack and sprinkle on seasonings. We like lemon pepper. Go light on the salt, if using, as pork is naturally high in sodium. Roast in a hot oven for 20 minutes; then lower temp and continue roasting . Once the roast is in the oven, begin the potatoes. Add salt, pepper, butter, sour cream and milk. 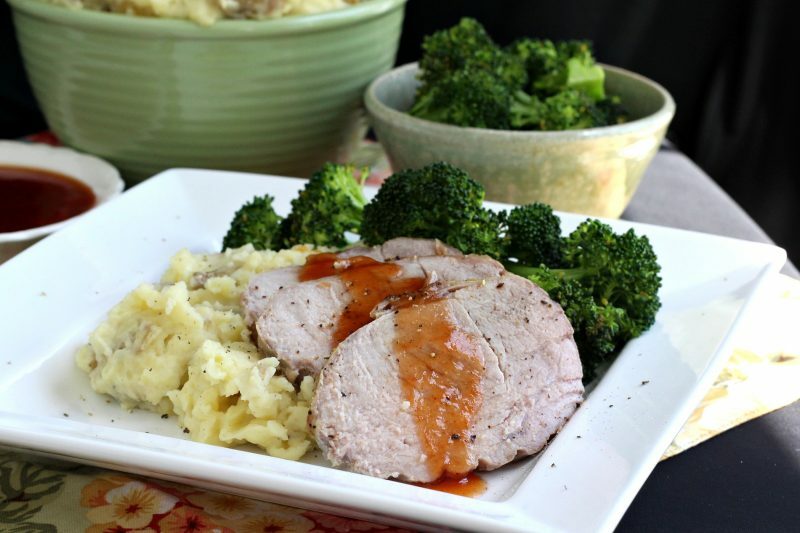 This simply, four-ingredient sauce, is so easy to make and is so good with pork roast. Click sweet and sour sauce for the recipe. Prepare the broccoli for steaming while the pork is resting. 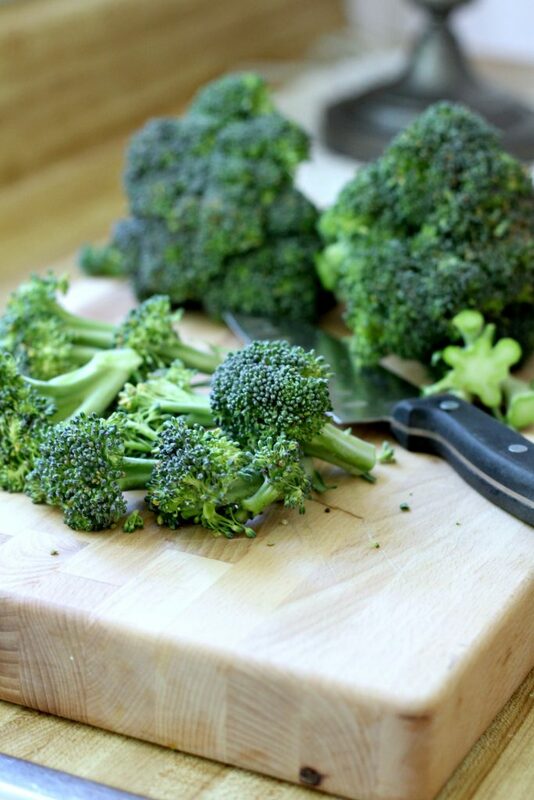 Wash and trim the broccoli and cut into pieces. Place in a microwave-safe bowl. 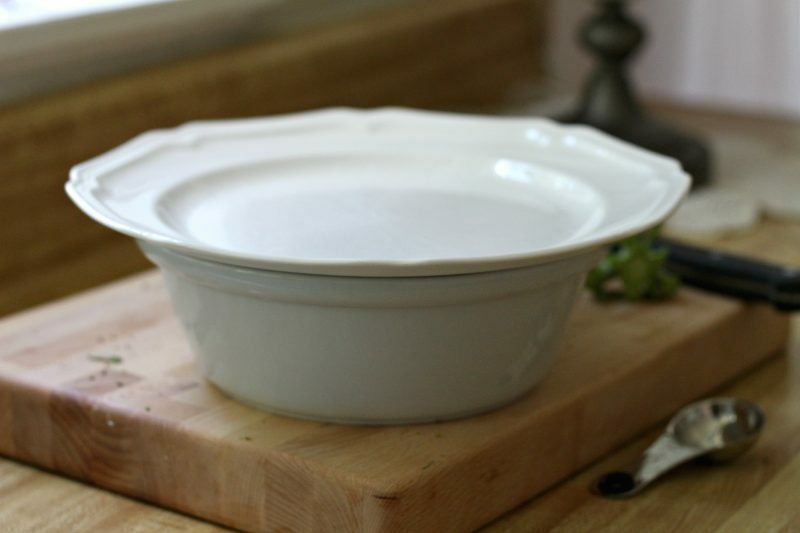 Cover with a plate or plastic wrap, leaving a slight opening for steam to escape. Microwave on high 2-5 minuted depending on how tender you prefer your broccoli. We like ours pretty crisp so 2 1/2- minutes was just right. Set the pork loin out on the counter for half an hour prior to roasting to bring to room temperature. 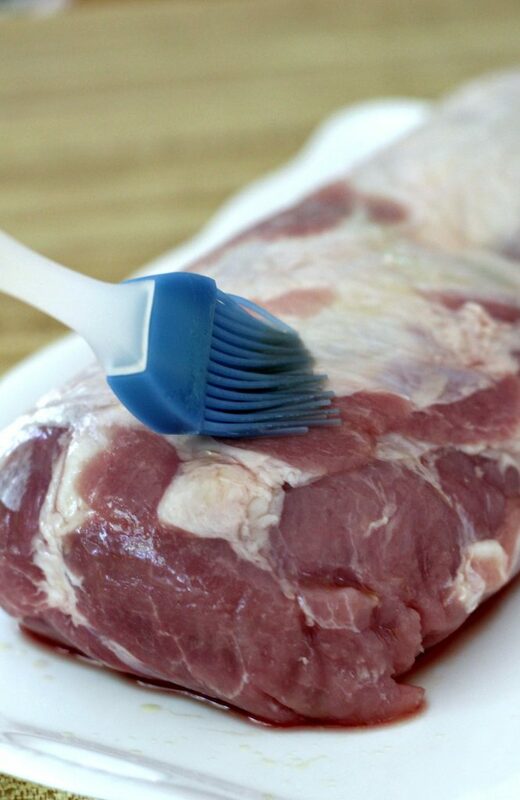 Brush the pork loin lightly with oil. Sprinkle on lemon pepper or seasoning of choice. Cover the bottom of a shallow pan with foil. Place a rack in the pan. 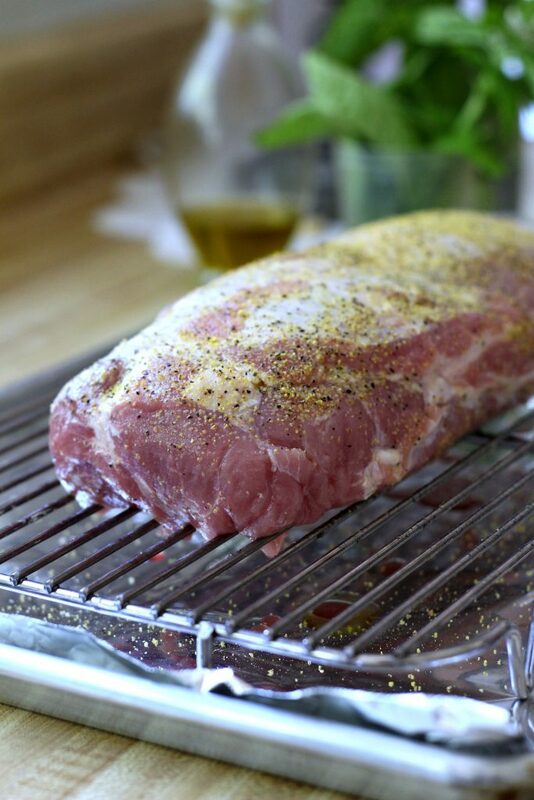 Center the pork loin on the rack with the fat side facing up. Roast in preheated oven on the center rack for 20 minutes. Reduce the oven temperature to 325 degrees F. and continue roasting until internal temperature reaches 145 degrees F. It should take about 20-22 minutes per pound. 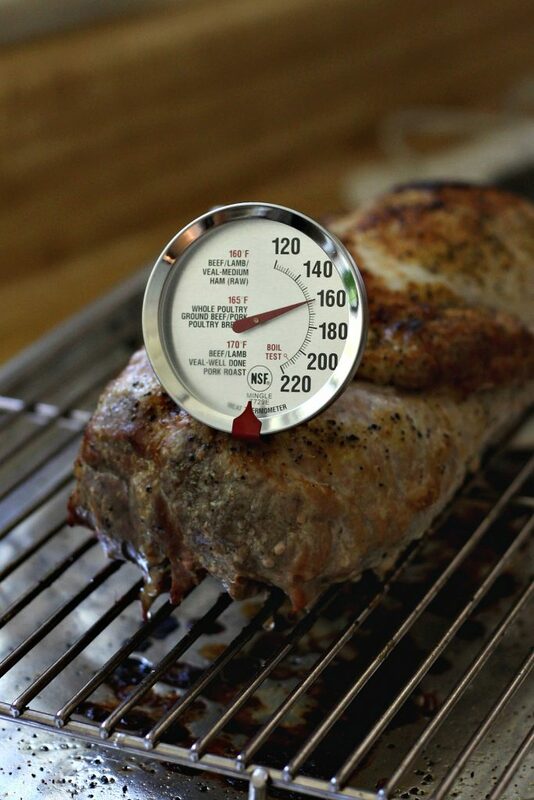 Check temperature toward the end of the cooking time with a meat thermometer. My 3.65-pound roast took an hour and 10 minutes after reducing the temperature to 325 degrees F. to reach 145 degrees F. After resting, the meat thermometer read 160 degrees F.
Remove roast from oven and tent with foil. Allow to rest at least 15 minutes before slicing. Wash and peel the potatoes. 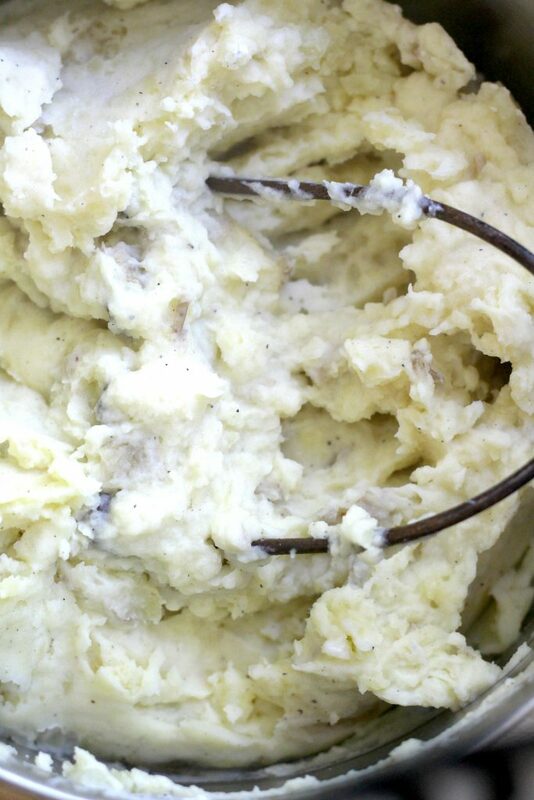 I do not remove all of the potato peel because we like it mixed through the mashed potatoes. I usually cut off the ends and peel away only sections where needed. But, if you prefer, peel them completely. Cut the potatoes into 1 1/2-inch to 2-inch chunks. Add to pot and cover with cold water. Bring to a boil. Place a lid, slightly ajar on the pot, reduce the heat to a gentle boil watching so it does not boil over. Cook about 20 minutes until the potatoes are fork tender. 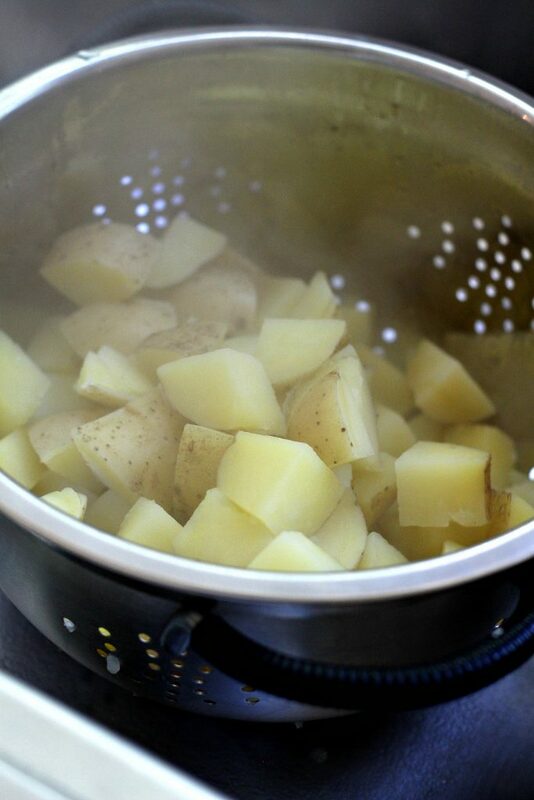 Carefully pour the potatoes into a colander to drain and then return to the pot. Add butter, salt and pepper and begin mashing. Add sour cream and milk; continue mashing until desired consistency, adding additional milk, if desired. 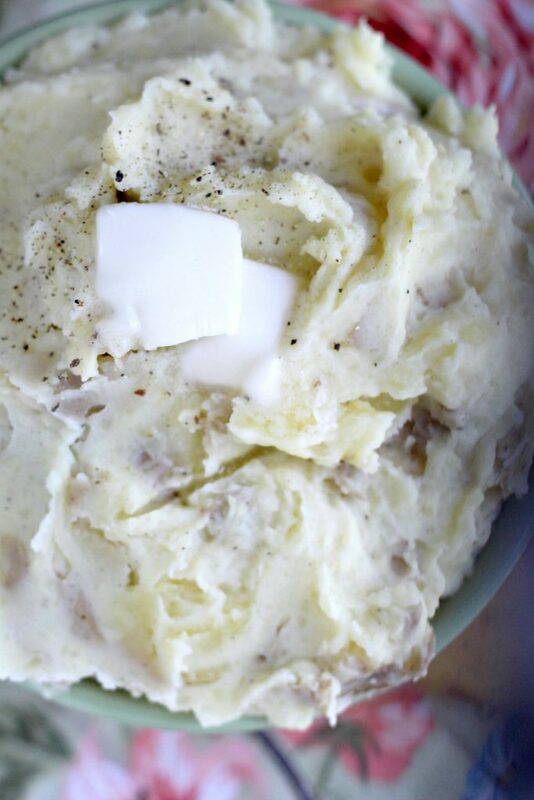 Our preference is for creamy mashed potatoes with small chunks throughout. 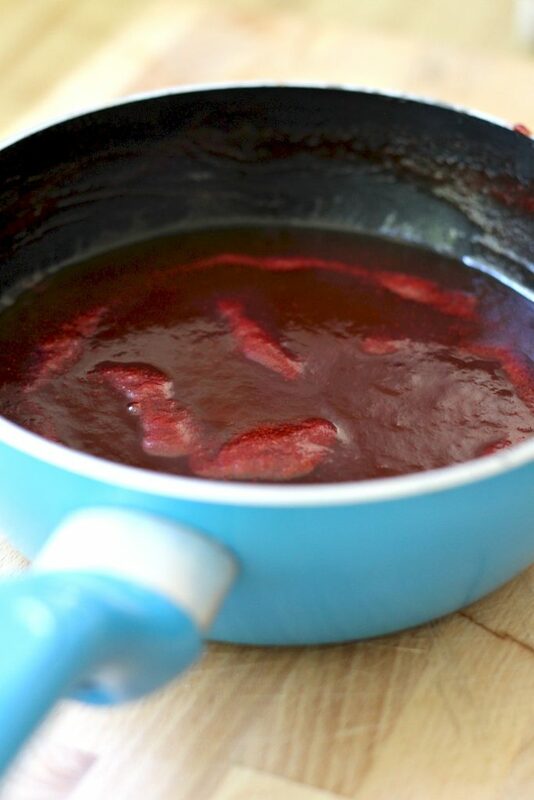 While the potatoes are boiling, make the sweet and sour sauce. Click Sweet and Sour Sauce for recipe. The steamed broccoli takes very little time so make it while the pork is resting. 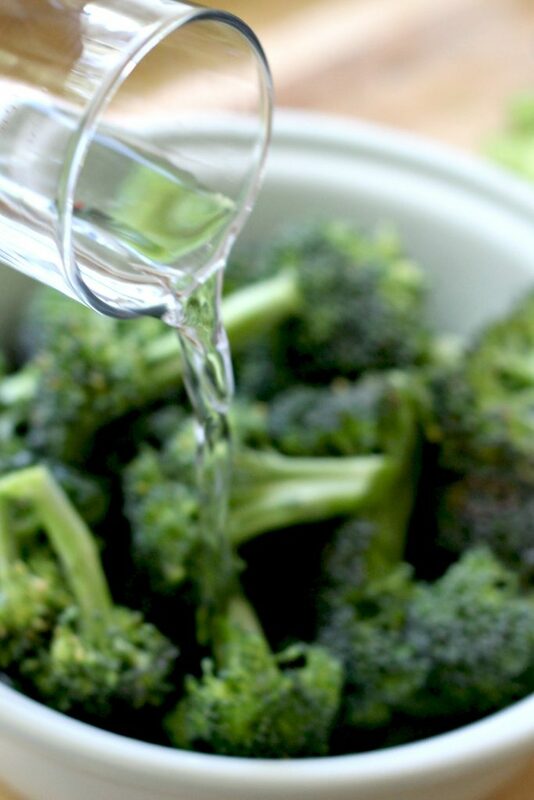 Wash and trim the broccoli. Cut into pieces and place into a microwave-safe bowl. 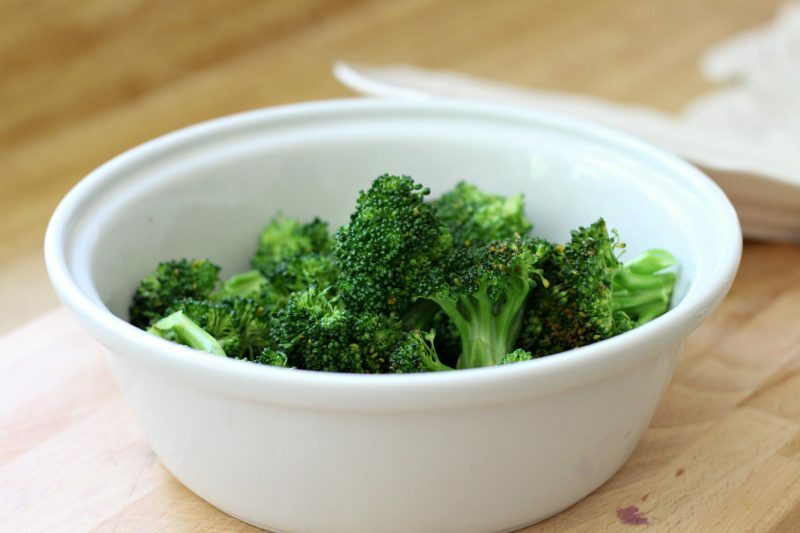 Add 2-3 tablespoons of water and cover bowl with a plate or plastic wrap, allowing a small opening for steam to escape. Microwave on high 2 minutes. Test for doneness and, if needed, microwave 1-2 minutes more. I miss Sunday dinners, though we still eat our bigger meal at noon on Sundays and find it a nice day to have guests after morning church. But the dinners my mom made on Sunday were similar to what you have shown here. She had the roast in during church and apparently had already prepared the sides but I don’t remember how. She always made extra and would often invite people home from church to eat with us–often single people or visitors, or people who needed a bit of encouragement.